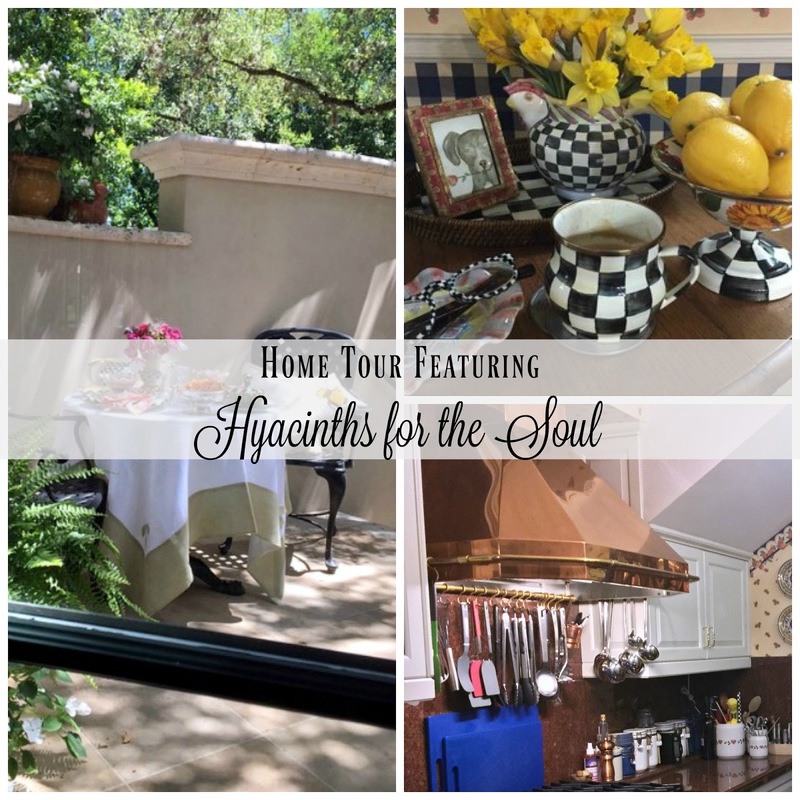 Welcome to the June 2018 First Friday Home Tour featuring Sarah's home and her blog, Hyacinths for the Soul. Many of you who have been reading blogs for awhile may be familiar with Sarah and her fabulous home in Austin, TX. Whether you know Sarah already or not, you are in for a treat! Sarah will be telling you a little about her home. Any words you see that are highlighted in this post will take you to a special spot on Sarah's blog. I've been passionate about interiors since childhood, and there is no question, I was born with the collecting gene. Gardening, stitching, entertaining, and travel are also high on my list. Hyacinths for the Soul is mostly about friendship, fluffing one's nest, and sharing a creative spirit. I'm not a minimalist, but rather a collector, interested in many different things. Our home has evolved over time with layers of both old and new. Our style is rather eclectic. Our home, built in the 1930s and remodeled in 1995, has lots of character with interesting ceilings upstairs, various levels, and a woodland setting in central Austin. It's just me and the chef and this sweet girl, Sadie Mercedes. Like most homes, the kitchen is the heart of our home, so I thought that is what I would share. Being a galley kitchen, it is small by most standards, but you'd be surprised by how efficient it is. Both the refrigerator and freezer are concealed within drawers and cabinet doors. My chef designed our kitchen when we remodeled this home, and he prepares some amazing meals here. He does the cooking but I keep the copper polished! Married 43 years this summer, we make a good team. The Chef in the kitchen cooking and me setting a pretty table with my MacKenzie-Childs ceramics or other beloved dishes. The opposite end of the kitchen is a cozy sitting room that looks out to the garden. It's perfect for being close, but not underfoot while the chef is busy in the kitchen. It's also a favorite spot for morning coffee on those mornings when we aren't out on the sunporch or outside on the terrace. Of course, if this is where we are, Sadie will be there too. My mother-in-law started me on collecting French faience in the mid-1970s. 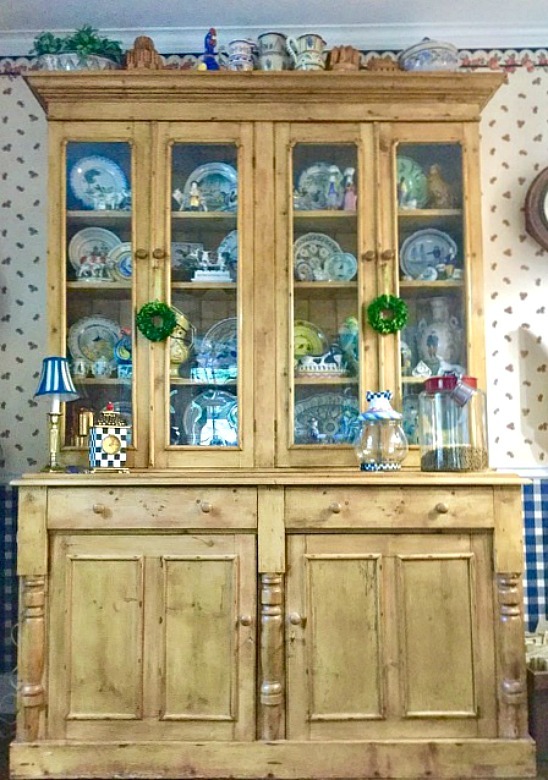 Most of my pieces are in this room, both in the Irish pine cupboard and on special shelves we had built above the door and window frames. I mentioned that we live in a woodland setting. Our backyard offers an oasis within the central city. With different levels and lush greenery, it is a delightful spot for alfresco dining. As the name of my blog implies, we live a simple life but cherish the extra pleasures that feed our souls. 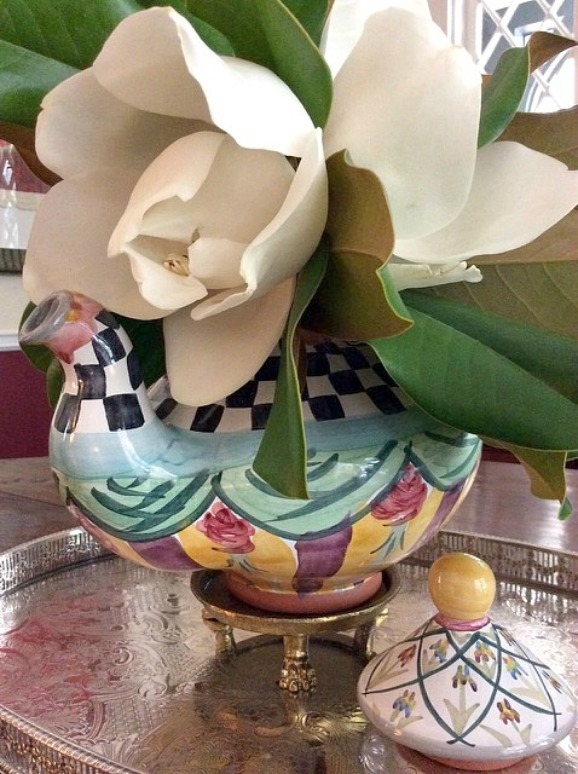 I welcome you to see more of our home and garden shared on Hyacinth for the Soul where I like to share tablescapes, the occasional recipe, my collecting habit, and gardening. Specifically, you can find a Garden Tour post here. 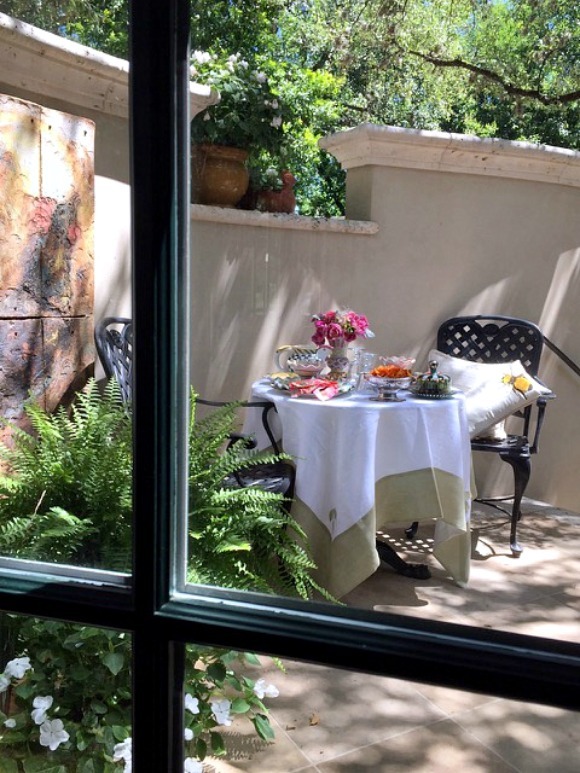 Thank you so much, Sarah, for sharing your gorgeous home in Austin, TX with us! Don't you just love her style? I wanted to point out a few links...Sarah is a member of the Traveling Totes girls who all love and carry Mackenzie Childs tote bags. These ladies are friends in real life and meet in fun places. Sarah's house is positively breathtaking. I love every darling detail especially the Quimper and MC treasures. I hope that you and Sarah have a wonderful weekend!! I always love peeking into Sarah's beautiful home. I had never seen the exterior though...beautiful. What a treat. Thanks for sharing, Stacey! Sarah's home is amazing. I adore her kitchen, such a fantastic place. I just love her eclectic style in the wooded setting. Beautiful! What a lovely home. Love the warmth of the kitchen. Reminds me of a quaint bed and breakfast. And the gardens! Gorgeous. Sarah is a dear friend and I love her style. Every little thing always looks perfect. She has such wonderful collections, MC and Quimper collections are amazing. I could live in her kitchen! Happy weekend. Okay, I'm totally jealous of her green thumb and lush gardens. It's like walking through Busch Gardens! Seriously beautiful. Thanks for sharing. Everything was so cute! How amazing!Stunning home and garden! Stacy, thank you for featuring our home and thanks to all your readers for their kind comments. It's fun to meet some new bloggers, so I'm off to visit. Thanks again! Hi Stacy! My friend Sarah let us know about your blog and her feature. I have always loved Sarah’s style, and look forward to spending time with her this summer at the MKC barn sale in Aurora NY. She has such wonderful landscaping and collections, and the chef designed a wonderful kitchen. Happy Weekend to to and Sarah. Oh, Stacey- you've done it again! 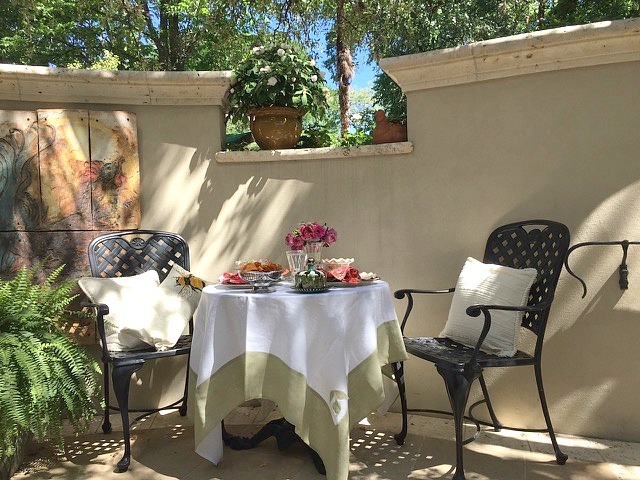 Sarah is such a dear sweet blogger and I so enjoyed seeing her wonderful husband, and Sadie pup, and her kitchen and her backyard oasis.............what a splendid place to dine outdoors when the weather is kind! Thank you for your home tours - just love every single one of them. Sarah’s home is beautiful! I love that she has her own live-in Chef! I love her collections and her gardens! Thanks for sharing, Stacey! Thanks for featuring Sarah. She is such a dear! I loved seeing her home, kitchen and garden. Nothing but charm just like Sarah! I love Sarah's home. 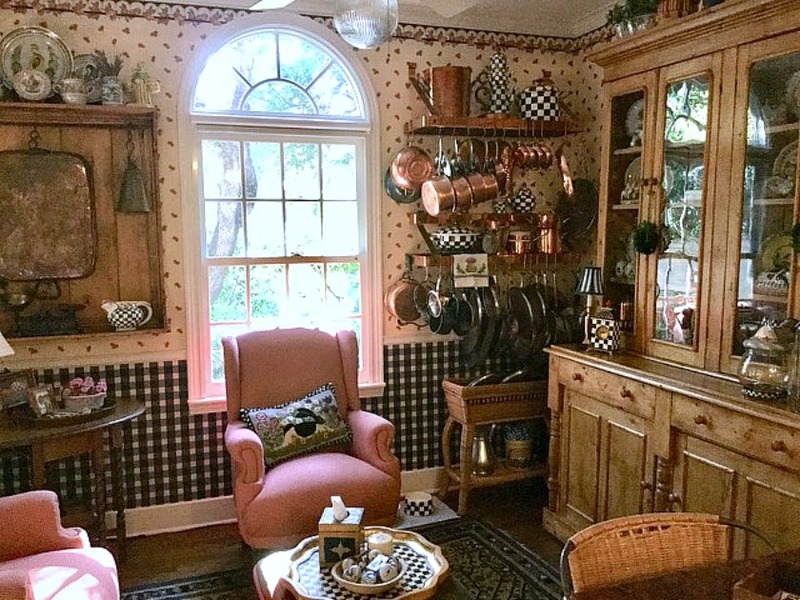 I've never seen a front picture of her lovely home as well as the kitchen and seating area opposite the kitchen. Sarah has wonderful taste! I also am glad she shared a picture of her husband in his favorite spot. Sarah's home is the kind that makes me feel truly welcome to see in print, and want to be submerged in. I would want Sarah to tell me everything about everything she's ever collected in that kitchen and sitting room! Thank you for sharing Sarah's corner of the world! We always loves a home tour. I am headed there now to look at that back yard. Looks wonderful. What a lovely home! I love her kitchen. I would love to sit in Sarah's home and ask her questions about all of her beautiful collections. Oh goodness everything is stunning. Plus, is there anyone nicer than Sarah? What a beautiful home and such a gorgeous garden! I’m drooling over that garden and pine hutch! Stacey, sarah’s Home is so lovely. 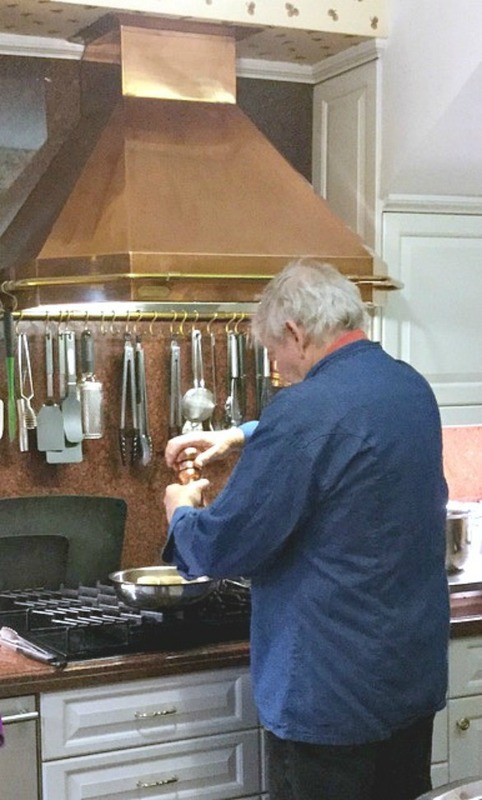 How special to have your very own chef. The kitchen is perfect. I am wowed by the exterior grounds, walkways and gardens. Sarah is a sweet friend , whom I have the pleasure to be her fellow tote gal. 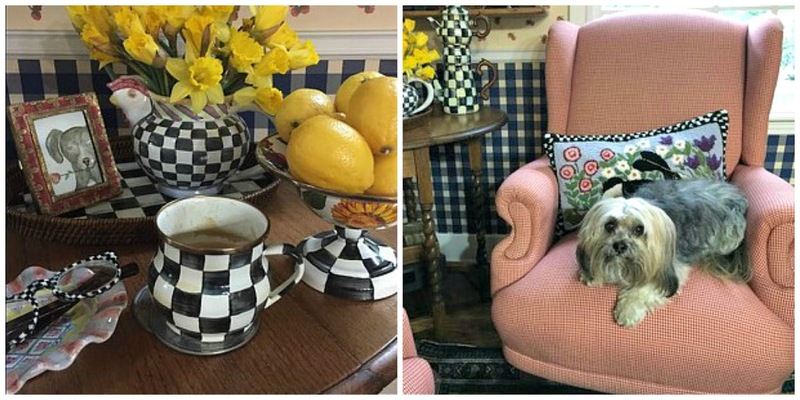 Love Sarah...we share our love for MacKenzie-Childs. Love seeing her "chef" in action. Sarah's home is truly filled with a beautiful soul. How did I miss that beautiful image of the front of her home! Great, great feature here today Stacey!! Sarah's house is filled with so much personality. The kitchen alone would make me want to stay forever. Oh Stacey what a great tour today. Sarah's home is gorgeous. The outside of her home is absolutely stunning. I was swooning this morning. Happy Weekend. This home is mouth-wateringly gorgeous!!! And the yards....well, I'm simply drooling. Oh my, oh my, Sarah is indeed a collector. Layering old and new has a special charm. What a lovely home and garden! I'm thrilled to see more of Sarah's home, she is precious to me. 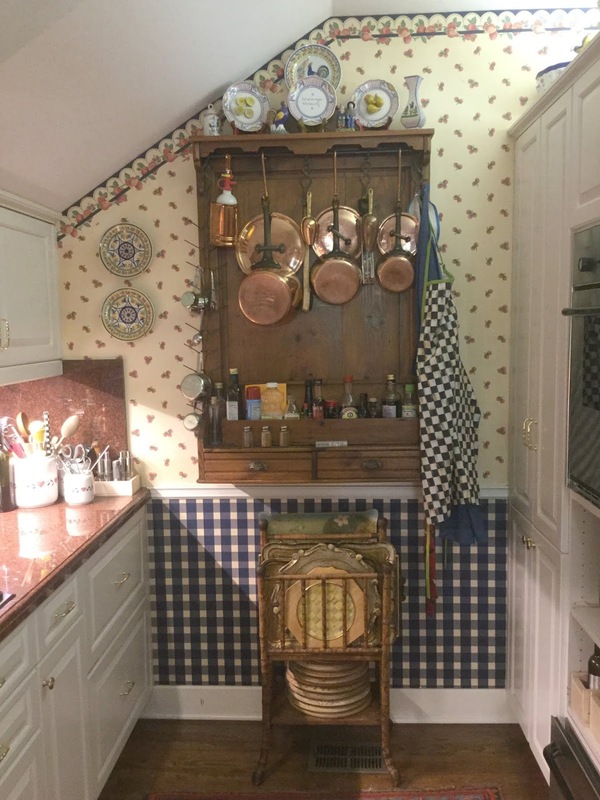 And that kitchen, adjacent sitting room, the collectables, and finally, gardens, have me head over heels for this gorgeous home and it's lovely owners! Thanks for sharing spaces in Sarah's house and yard I have never seen before. Not only is Sarah's house beautiful, Sarah herself is also beautiful inside and out. She is one of the kindest, most encouraging bloggers on the Internet. Thank you for spotlighting a very special lady. Sarah’s home is fantastic. I have always adored her outside garden areas. The inside of their home is wonderful- it tells a story. I envy her for having a husband that cooks! What a treat Stacey! I have gotten to know Sarah through blogging and our Traveling Tote group, and I have seen many of her beautiful things but only snippets of her house, it was a treat to see the entire street view, so lovely! Sarah is such a gracious friend and hostess and I think it's adorable that her husband, the "chef" cooks for her! 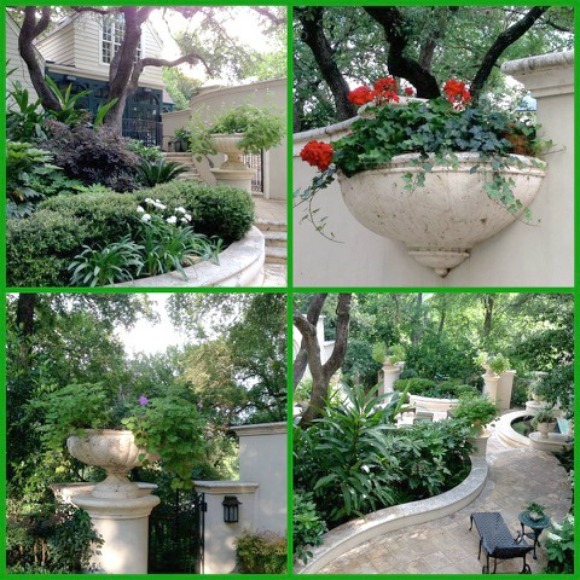 Her garden and landscaping is breathtaking! Although we've never met, I've "known" Sarah for quite awhile through blogging, Stacey, and know what a kind soul she is. I have always loved her warm, cozy home, both inside and outside. 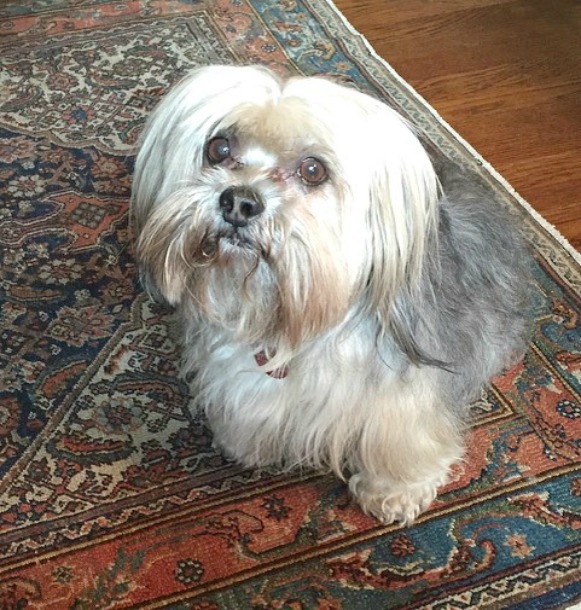 Of course, Sadie, always brings a smile to my face when I see her cute face. Isn't nice what a sweet couple, Sarah and her "chef" make? 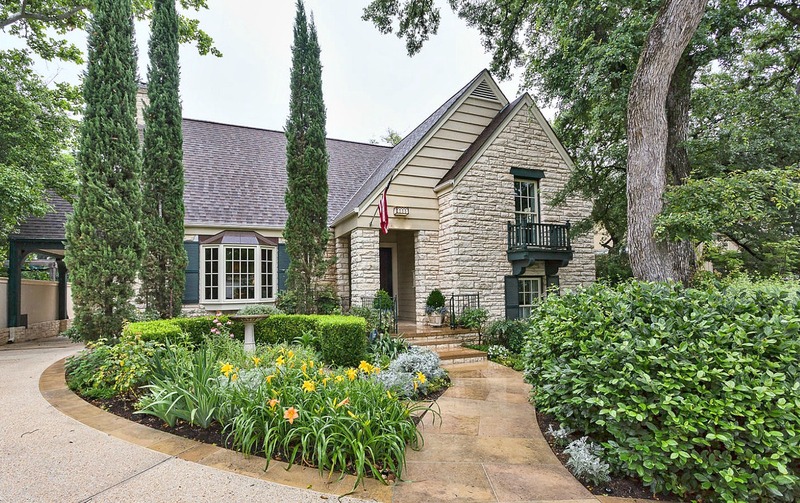 Thank you for showcasing Sarah's beautiful Austin home! Hi Stacey, I always love a home tour and Sarah's is a wonderful home. I'm happy to say I am one of her followers. Now, I'm happy getting to know you as well. I love Sarah's blog (And her luscious lemon pie) so it's a delight to see her fabulous and cozy kitchen. And thanks, Stacey, for weighing in on Dallas on my blog. I'm behind from travel and catching up but I loved the comments and thought they were a lot better than my post! Not only is Sarah's home lovely, but so is she. I count my blessings that we have met in person and again will meet this summer! She is not only sweet, but so much fun to be with. It is always fun to follow her travels with her "tote" and to peek into her "collections!" Waaw! beautiful house, this is looking like a dream home for me amazing pictures, thank you for sharing with us and keep sharing. A very late Happy Pink Saturday, Stacey. I apologize that it has taken me so long to visit. I want to thank you for participating in Pink Saturday, and I would like to invite you to join us every week. Of course, pink is our preferred color, but it is Anything Goes Pink Saturday. I would love for you to share any of your posts. Your blog is fabulous. Now, I have to tell you that I am a big Sarah fan, too. She has been participating with us in Pink Saturday for years. I adore her.♥ Thank you for sharing.